Sew Fantastic: What does 30 feel like?? What does 30 feel like?? It's like waking up after an extra 3 hours of sleep, to a dozen pink roses, a giddy little girl who just spent the whole morning with Dad. Lots of cute kisses and a little voice saying "hi momma" at the end of my bed. If this is how wonderful 30 is, then I do not need to age another day. Happy Birthday!! Ahh to be 30 again! Enjoy they are wonderful!! In the 6 years since then we got married and now have 2 little kids so I can only hope that you have as wonderful a year as I did and that it continues to get better like mine is. All the best wishes for you today and always. Happy birthday Terri! 30 was good, but each year since has been even better! Hope your day continues to be as nice as it started. Happy Birthday! Sounds like a wonderful way to start you day. Happy Birthday. You are so lucky to be only 30! Enjoy every minute. I'm so old I can't even remember what 30 felt like. Happy Birthday! What a wonderful wake up! Have a great day! Happy Birthday!! Hope your whole week is special! 30 felt a whole heck of a lot better than 40, but then 40 felt a whole heck of a lot better than 30 in different ways! Isn't it nice, they treated you so good. I am sure they remember how much you do to make their day special and wanted you to feel the same! Happy Birthday to you, and many more!! I think I have turned 30 many times over. 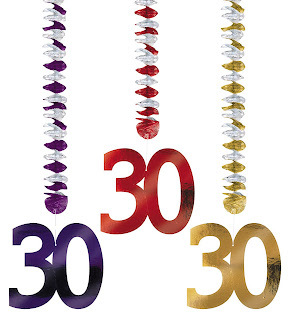 Enjoy 30, great times! Happy Birthday, Terri! Hope your day just continued to get better and better! Sounds absolutely PERFECT Terri! Happy Birthday! I can't believe I missed your birthday...so sorry...happy belated Birthday. I will put you in my February drawing for those who have birthdays this month! !